Linen Aprons Wholesale - Linen Apron for Trade, Restaurants, Cafe's, Bars etc. Linen Aprons Wholesale - Linen Apron for Trade Clients - Suitable for Restaurants, Cafe's and Bards etc. Aprons made from linen fabric, being a light but strong fabric, are the perfect fabrics to keep in your kitchen. Not only do aprons made from linen fabric repel dirt, but they are slow to catch fire, which makes linen aprons a safe choice for your kitchen. They suit for both domestic and professional use. Our wholesale and trade range includes linen aprons in 100% linen. 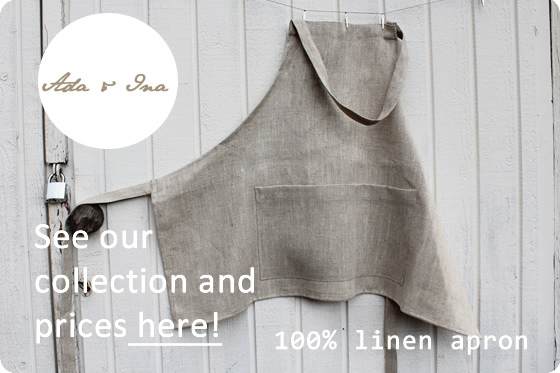 Linen aprons from our wholesale range at Ada & Ina are made from 100% linen fabric, a natural and ecological fabric. This choice is not only fashionable and practical, but an environmentally friendly choice of apron fabric, because linen is one of our most environmentally friendly fabrics to produce – it takes ten times less water to produce linen than cotton fabric.Flax is very strong and increases about 10% in strength when wet. The polygonal cross section of the fibres increases inter-fibre friction and hence flax yarns are not only very strong but also usually very firm. Flax is the strongest natural fibre in common use - so it can be recommended for fabrics in everyday use. Linen aprons can be used fashionably creased or stylishly ironed – whatever you prefer. Both will go well with your kitchen decor. At Ada & Ina we offer great prices on our wholesale linen aprons. The apron to the right is a short, chic café style apron. Check out Ada & Ina wholesale on linen aprons – quality 100% linen aprons for great prices.